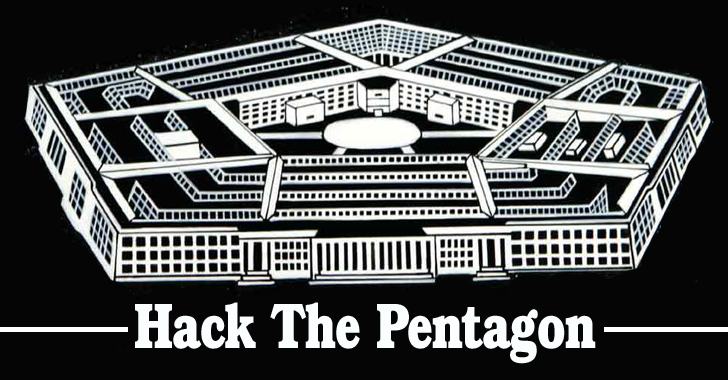 Update: 'Hack The Pentagon' has opened registration for its pilot bug bounty program of $150,000 for hackers in return for the vulnerabilities they find in its public facing websites. The Defense Department has enlisted the bug bounty startup HackerOne to manage the pilot program. Interested hackers can Register Now to participate in the Bug Bounty program. The United States Department of Defense (DoD) has the plan to boost their internal and network security by announcing what it calls "the first cyber Bug Bounty Program in the history of the federal government," officially inviting hackers to take up the challenge. Dubbed "Hack the Pentagon," the bug bounty program invites the hackers and security researchers only from the United States to target its networks as well as the public faced websites which are registered under DoD. The bug bounty program will begin in April 2016, and the participants could win money (cash rewards) as well as recognition for their work, DoD says. While announcing 'Hack the Pentagon' initiative during a conference, DoD said only "Vetted Hackers" can participate in the Bug Bounty program, which means the candidates need to undergo a Background Check after registration and before finding vulnerabilities in its systems. Moreover, candidates would be given a Predetermined Department Systems (might be real system alike) for a specific time period of the competition to access it. So, don't be confuse that the DoD will serve a critical piece of its infrastructure to hackers for disruption, rather the hackers will be allowed to target a predetermined system that is not part of its critical operations. However, the Department of Defense has not yet confirmed what bounty would be provided to hackers upon a successful penetration of its network or web pages. Why DoD launches a Bug Bounty program? Department of Defence currently manages 488 websites related to everything from the 111th Attack Wing, several military units to Yellow Ribbon Reintegration Program. "Bringing in the best talent, technology and processes from the private sector not only helps us deliver comprehensive, more secure solutions to the DoD, but it also helps us better protect our country." The hackers, foreign and internal criminals, are actively targeting government departments and critical infrastructure that could reveal national secrets. Last year’s massive security breach in the United States Office of Personnel Management (OPM) revealed the private information of over 21.5 Million US government employees. Just last month, an unknown hacker released personal details of at least 20,000 Federal Bureau of Investigation (FBI) agents and 9,000 Department of Homeland Security (DHS) officers. Almost three years ago, the Pentagon said the Chinese government had conducted cyber attacks on the several United States diplomatic, economic as well as defense industry networks. Therefore, the real purpose of launching dedicated bug bounty program for hackers could be a government initiative to identify vulnerabilities in its infrastructure that may expose any endangered state secrets. Just like Bug Bounty programs offered by several Frontliners in the technology industry, Hack The Pentagon would also be an exercise for the federal authorities to boost up the security measures and counter the cyber attacks. Instead of usual self-conducting Security Audit by the DoD internals itself, the new initiative would provide an opportunity for the fresh brains outside the Pentagon to challenge DoD infrastructure and enhance the security measures.